From Tuesday 29th March The Bell & Brisket is taking over the kitchen at The King & Co in Clapham, serving their signature salt beef sandwiches, plus some great 'knife and fork' dishes, and some excellent brunches at the weekend. Bel and her team have been regulars on the street food scene for the past 5 years or so, and always deliver the goods. You've got to go! 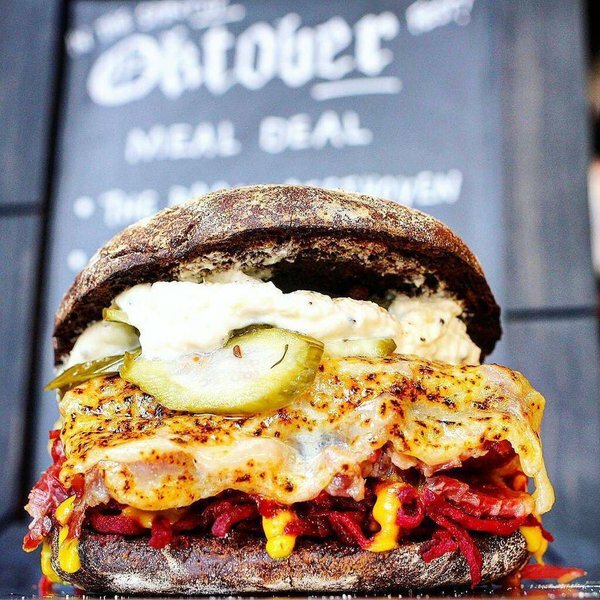 "Critically-acclaimed streetfood trader The Bell & Brisket is bringing their signature salt beef to South London, with a new five week residency at independent pub The King & Co in Clapham. The popup will start on Tuesday 29th March and see owner Bel Shapiro serving up the juicy hand-brined salt beef bagels stuffed with crunchy pickles, blow-torched cheeses and spicy sauces that she has become so famous for on the London food scene, alongside an array of irresistible new dishes and weekend brunch. The Bell & Brisket’s April residency at The King & Co will showcase Bel’s legendary collection of pimped-up bagels including The Lord Rupert topped with pickled cabbage, Dijon mayonnaise, melted Cheddar and Vadasz Deli dill pickles; and The Duke with roasted tomato chipotle relish, pickled onions, melted Monterey Jack, jalapeño sour cream and Vadasz Deli Hot Roots. Pub visitors can also enjoy tempting new smaller plates like ale-braised Brisket Croquettes with pickled red onion and fresh horseradish sauce; larger plates like Hot Smoked Mackerel with salsa verde quinoa and grilled marinated broccoli; as well as ideal sharers such as indulgent Filthy Fries and a Trio of Sliders served on mini black rye buns. Those wishing to follow their salt beef fest with something sweet can experience a sensational Chocolate Ganache on Rye dessert created exclusively for Bel’s new South London kitchen residency by fellow streetfood stars Batch Bakery, which is inspired by the classic deli ingredients that are a key element of The Bell & Brisket’s cooking whilst remaining true to Batch Bakery’s expertise in coca-themed treats. During the daytime on weekends, the popup chef will be serving a mouth-watering brunch menu featuring The Full Irish with creamy Colcannon, thick-sliced salt beef, parsley sauce and caramelised shallots; plus a host of Hash It Up crushed potato and onion hashes topped with breakfast favourites poached egg and hollandaise, and Bel’s own twist on salt beef “bacon”. Hailed as one of Evening Standard’s top 10 boozy brunches in London, The King & Co bar team will also offer bottomless Bloody Marys, Cava and selected cask ale for a mere £15 more for diners taking advantage of The Bell & Brisket’s hearty new brunch menu"